Will it ever end? That’s the question lingering in the minds of the people of Flint, Michigan. Home to some 100,000 residents, the city has undergone its fair share of setbacks through the years including, but not limited to, the downsizing of General Motors. Though recently gaining more attention from the media, Flint now seems locked in a drinking water contamination crisis that hasn’t let up since April 2014. 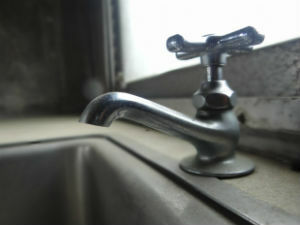 Corrosive water has loosened lead in supply lines to homes, businesses, and churches, making tap water unsafe to drink. Muddied by a divisive political environment, little progress seems to have been made to resolve the issue. Local Church of God pastors are now shedding some light on the problem, offering insights underemphasized by the media, prayers we can pray, and things we can do to help. Church life has been affected by the water crisis, too. Water fountains—shut off. Faucet filters—installed. One couple in the church that lives outside the city limits actually hauls water to church in a cooler so people can have enough water each week. This clean water has been vital to a church that uses its kitchen to prepare meals for the community four to five times each month. Herbert Banks is the lead pastor of New Creation Church of God in Flint. Though his home just outside of Flint has kept his family from being directly affected, he explains that more than two hundred people in the congregation live inside the city. As a result, the church has been quick to distribute as much bottled water as they can. “At this point, we have no idea who’s been affected by contaminated water,” Banks explains. “Every time we have a member sick or in the hospital, we’re wondering if it has to do with the water.” Because lead contamination can take more than thirty days to fully materialize, even blood testing hasn’t proved consistently accurate for many in the community. Our churches aren’t just reacting to the situation, however. They’re doing something about it. New Creation Church of God and West Court Street have both collected and distributed water for those in need. Before the government began offering free filters, God’s people were doing it—including West Court Street Church of God. When the local elementary school within one mile of West Court Street tested positive for lead, the church stepped in to help. 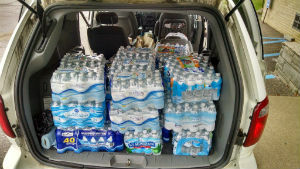 The body of Christ far beyond Flint has rallied together to send bottled water and contribute financially. Bill Jones, state pastor for the Church of God in Michigan, along with the pastors of Flint, agree that the following two websites offer the best, united approaches to helping the people of Flint: www.helpforflint.com and www.unitedwaygenesee.org/civicrm/contribute/transact?reset=1&id=5. This entry was posted in All Church of God, Great Lakes and tagged Bill Jones, current events, Flint, Herbert Banks, Michigan, New Creation Church of God, Niki Christiansen, Paul Christiansen, water contamination, water crisis, West Court Street Church of God. Bookmark the permalink.